Cataracts are cloudy areas on the lens of your eye that interfere with your ability to see clearly. If you’re anticipating having cataract surgery near Chicago, you can talk to your eye doctor about what you can expect from the procedure. 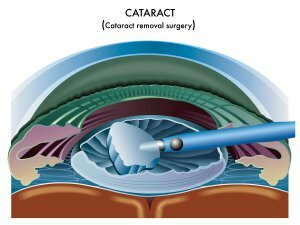 Your cataract surgeon will determine if you’re a good candidate for the surgery, inform you of the potential risks, and explain the many benefits of cataract surgery. Before having any type of surgery, you can expect to undergo some tests and discuss your medical history. For cataract surgery, your eye doctor will perform an A-scan to measure the length of your eye. Then, keratometry is used to measure the curve of the cornea. These measurements will inform your eye doctor’s recommendations for the type of intraocular lens (IOL) implant that best suits your needs. The lens implant can provide full vision correction . In addition to discussing the different types of IOL implants available to you, you’ll be asked about your medical history. Your eye doctor will need to know if you’ve previously had eye surgery, such as LASIK surgery. Additionally, you’ll need to disclose all of your medications, since certain drugs can interfere with pupil dilation. There are a few techniques that may be used for cataract surgery; however, phacoemulsification is most often used. First, your eye doctor will apply a local anesthetic to eliminate discomfort. Then, a very small incision is made in the cornea. The ophthalmologist inserts a tiny instrument that emits high-frequency ultrasound to essentially liquefy the lens so that it can be suctioned out. The next step in cataract surgery is to place an IOL implant. Finally, the incision is closed. It’s important to follow your eye doctor’s post-operative directions. After your surgical procedure you will rest for a little while in a recovery area. You will need someone to drive you home after your surgery. You may be up and about as you wish, but avoid strenuous activities. Also you will experience sensitivity to light that may require you to wear sunglasses on the day of your procedure. You’ll also need to apply eye drops as directed by your eye doctor.